It’s audit-time again and the auditor wants to see just how well the company is in control of its quality management system. Amongst other aspects, the auditor is primarily interested in the company’s processes. Ah yes, there’s that word again – “process”. Regardless of whether ISO 9001, ISO 13485, or IATF 16949 certification, all these standards require that responsibilities and workflows are recorded in writing in shape of expressive process descriptions. How well these process descriptions are thought through and designed can, amongst other aspects, be the factor that decides whether certification is successful or not. This is not really surprising, as whether organizing company structures, depicting responsibilities, or communicating interdepartmental SOPs – processes are the centrepiece of corporate leadership and the key to successful company management and product development. Apart from structuring day-to-day business, the transparent visualization of processes, responsibilities, targets and risks directly assists companies on their way to successful business conduct. It therefore never harms to take a closer look at one’s processes from time to time in order to update or improve them. True to the sense of continuous improvement, processes should not just be viewed as isolated entities but should instead be put into perspective with regard to the big picture. If context and big picture are not drawn into consideration, continuous improvement only takes place at a small scale and may result in micromanaging processes which may need to be rethought in their entirety. One must always be prepared and ready to challenge every detail, process, and convention. The CAQ.Net® software Process.Net not only supports users during the visualization of processes via e.g. the Turtle Diagram, but also facilitates the creation and management of processes via flowcharts or, for example, IATF-compliant APQP forms. 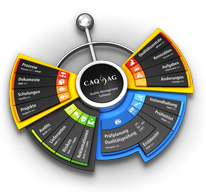 The direct interplay with other CAQ.Net® modules means that real-time information regarding the validity of attached process documents or required employee skills is always available, as said information is retrieved directly from within the applicable document or training management module. Applying the risk-based approach as required by the ISO 9001 is also possible in Process.Net, because all processes can be equipped with a dynamic risk-matrix which depicts the possible risks and chances for the company right next to the process itself. With its various web applications, CAQ.Net® provides sophisticated management solutions for the company-wide exchange of process-relevant data. These applications are highly refined tools for practicing browser-based and cross-platform process management wherever you are and always ensure that the people required for a given process can participate and be kept up-to-date. The perfect interplay with the document and process management modules provides employees with 24/7 access to relevant company knowledge which they can internalize via self-study and check their level of knowledge via a web-based interface. All of this serves as basis for creating a dynamic and continuous improvement process which benefits everyone from the individual employee to the overall company.